We are undertaking a four-year research program which aims to help safeguard the vegetable industry by reducing its dependence on herbicides and tillage for weed control. The overall goal is to give growers the very best weed management practices to ensure they can continue to deliver quality vegetables to Australian consumers and export markets for years to come. This work is based on two scoping studies conducted by the research team in this field: Weed management for the Australian vegetable industry (completed in 2014); and Sustainable broadleaf weed control in cucurbit crops (completed in 2011). 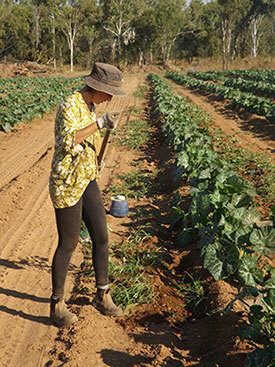 The project will deliver a suite of tools and techniques to make vegetable fields less hospitable to weeds, minimising the need for intervention and dealing weeds a knockout blow. As part of the project, we’ll conduct field trials in various States, and consult with growers across the nation. These findings will culminate in Australia's first Vegetable Industry Weed Manual. This four year project is funded by Horticulture Innovation Australia (VG15070), using the vegetable industry levy and funds from the Australian Government. Integrated weed management (IWM) is about combining a series of small management changes to produce a big result. Continually using only one or two methods of weed control, such as herbicides or tillage, can apply evolutionary pressure that encourages the growth of weeds resistant to those methods. IWM doesn’t require a drastic change in management, but together these integrated practices could add up to a profound difference in the weed burden that growers deal with from year to year. This project aims to measure and cost-out these types of integrated strategies, with a focus on high priority weeds. 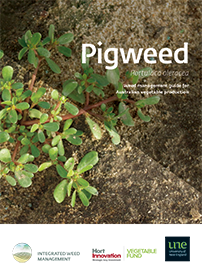 To better understand weed germination and early growth and timing to optimise herbicide effectiveness. To advance and better understand other weed control measures such as green manure/biofumigant crops, crop rotation, irrigation and crop orientation practices, and hand weeding implements and techniques. 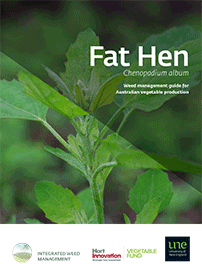 To assess the cost of specific weed management methods and impacts on yield and quality of produce at the farm level. 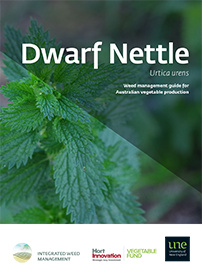 To provide region-specific extension materials and decision support tools on integrated weed management (made available in several different languages where appropriate), and production of a Vegetable Industry Weed Manual. Coleman, M., Fyfe, C., Tiwari Pokhrel, S., Marshall, G., Sindel, B. and Kristiansen, P. 2018. Exploring and extending integrated weed management opportunities in the Australian vegetable industry. 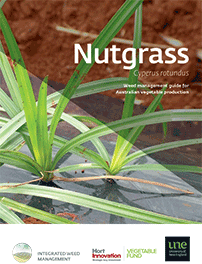 In Proceedings of the 21st Australasian Weeds Conference, eds. S. Johnson, L. Weston, H. Wu and B. Auld. The Weed Society of NSW, pp 49-53. Tiwari, S., Kristiansen, P., Sindel, B., Vo, B., Coleman, M. and Fyfe, C. 2019. Abundance and distribution of weeds in seed banks of vegetable fields of Australia. In Proceedings of the UNE Postgraduate Conference 2019. University of New England, Armidale. War on vegetable weeds increased. The Land, 16th November 2016. On-farm trial: Weed management effectiveness through winter cover cropping. WA Grower 53(2), p. 22. All addresses were current at the time of publication. If you notice any errors or would like to suggest more materials, please contact us. Horticulture Innovation Australia Limited (Hort Innovation) makes no representations and expressly disclaims all warranties (to the extent permitted by law) about the accuracy, completeness, or currency of information in materials produced for the project 'A strategic approach to weed management for the Australian vegetable industry'. Reliance on any information provided by Hort Innovation is entirely at your own risk. Hort Innovation is not responsible for, and will not be liable for, any loss, damage, claim, expense, cost (including legal costs) or other liability arising in any way, including from any Hort Innovation or other person’s negligence or otherwise from your use or non-use of materials from 'A strategic approach to weed management for the Australian vegetable industry', or from reliance on information contained in the material or that Hort Innovation provides to you by any other means. 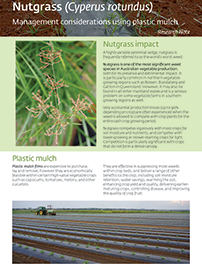 Copyright © Horticulture Innovation Australia Limited 2017.